Outdoor banner stands are robust weather-resistant displays designed to get your marketing message across outdoors at sports events, county shows, concerts and more. 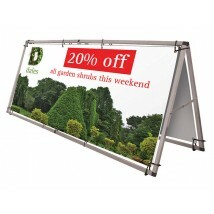 Weatherproof durable PVC banners are easy and quick to fit. 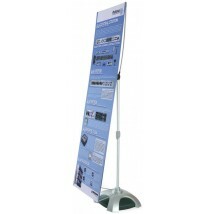 Many people use indoor Banner stands at outdoor events. On a still bright day that might be OK, but a little wind and you will find they fall over or the rear poles bend. Most indoor banner stands don't have waterproof graphics so they can be ruined in a shower. 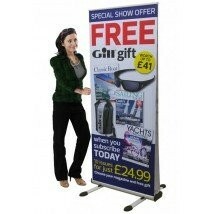 If you intend to use a banner stand outdoors the extra cost will be worth the investment. 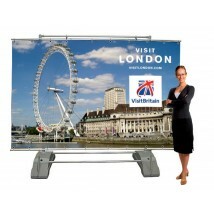 Specifically designed for outdoor promotions at high traffic areas of display. 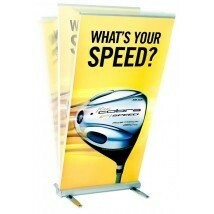 All our outdoor banner stands are constructed to withstand different wind speeds. Most of the freestanding range with water filled bases will withstand winds of approximately 12-16 miles per hour. 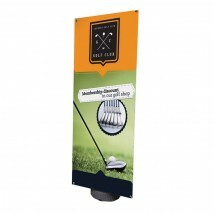 Our range includes our unique Y-band outdoor bannerstand that we have been selling for over 10 years, as well as some durable and quick to assemble outdoor roller banners. Our range of outdoor banners include waterproof PVC graphics to ensure your marketing messages stay vibrant for longer.